The Nature's Greeting is the New Generation of Greetings! Instead of cluttering a drawer as traditional greeting cards usually do, The Nature's Greeting beautifies and reminds the receiver daily of how special they are.This unique gift idea is designed and guaranteed to surprise, excite, and amaze! Nature's Greeting is the gift to be remembered for years to come, as it will certainly become as recognizable as the traditional greeting card. The Nature's Greeting is a rare breed of bean. 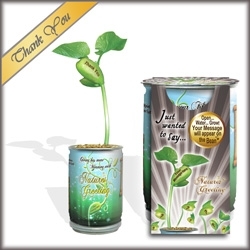 In each can, one bean is pre-planted in a special mineral soil. According to the instructions, after watering; the bean grows up to a height of 10-20 inches or 25-30 cm. The message or greeting anticipated by the receiver will be found engraved on the beautiful plant's central bean. The Nature's Greeting is all-natural and may be kept as a keepsake or actually grown. The bean engraving and coloration process are non-toxic. The Nature's Greeting originates from the fairy tale "Jack and the Beanstalk." In this tale, a small magical bean creates a huge beanstalk that is mysterious, romantic and offers a magical gift to its owner. Make a wish as you open the can and you will be as lucky as Jack in the fairy tale. Recommended temperature 60F- 95F (16-35c). Open the drainage tab at the bottom of the can then remove the top. Water until excess water drains out of bottom, then replace plastic cap. Do NOT add water again until the bean emerges. Estimated time of germination and revealing personal message is 3-10 days.